December | 2016 | Killed in a Smiling Accident. 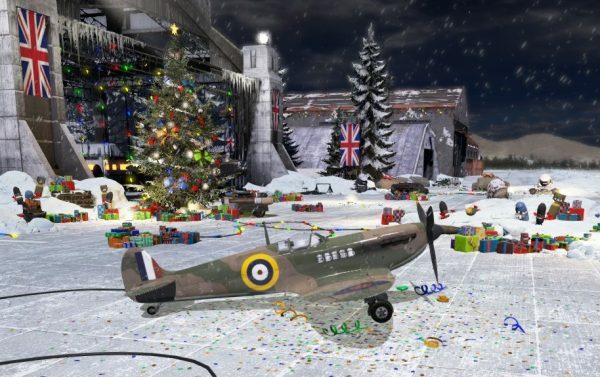 The Wintersday event is active in Guild Wars 2, a series of challenges have kicked off in War Thunder, the Steam sale is bringing joy, happiness and cheap games to all; it must be Christmas! Have a splendid break one and all, let’s hope 2017 is a bit less “exciting” than 2016. This entry was posted in waffle on December 23, 2016 by Zoso. I mentioned in the 10th anniversary post that The Division was a fine game that got rather repetitive in its endgame, and that I ought to have a look at the most recent update. Like healthy eating and regular flossing it was more of a vague intention than a firm commitment; I’d briefly popped back to check out the previous Underground DLC that added some randomised subterranean roaming, but it hadn’t proved terribly compelling. The most recent update is titled Survival, and doing exactly what it says on the tin it adds a new game mode called “Attempting To Endure Extremely Hostile Conditions With Minimal Starting Equipment”, or ATEEHCWMSE as all the cool kids call it. Actually, it might be called “Survival” come to think of it. A fierce storm is forecast to hit New York but Because Of Some Plot (TM Van Hemlock) there’s an urgent need to retrieve a MacGuffin, and in a wildly unexpected turn of events the simple helicopter jaunt to grab said MacGuffin goes a bit wrong, leaving you stuck in the middle of a blizzard with only a pistol and a nasty cough. You have to scrabble around for warm clothes, food, water, medicine, weapons, and ultimately a compensation form to claim for the luggage lost in the helicopter crash (or possibly the antivirals that were the original point of the mission), then make it to an extraction point to evacuate. Survival games have been in vogue since the blocky ubiquity of Minecraft and ah-but-who-are-the-real-monsters horror of DayZ, but I tend to flounder in very open worlds. In this respect the clear goal of Survival harks back more to Rogue: down to the heart of the dungeon/Dark Zone tooling up along the way, grab the Amulet of Yendor/Antivirals, home in time for ascension to demigodhood/tea and medals. You have an hour until you succumb to infection, a timer that can be extended with painkillers and medicine but not indefinitely, so you can’t faff around too much. The new mode does put a nice new spin on The Division. I posted about STALKER: Call of Pripyat a while back, how my favourite part of the game was early on when every round of ammunition was precious and that it lost some its charm later on once geared up with advanced weapons and armour. The Division is handing out loot more freely now, which is much appreciated, but when knee-deep in maximum level gear and trying to work out the relative merits of slightly different gloves it’s quite fun to go back to a situation where you’re glad of anything, even canned food. It’s available in PvP or PvE modes, though I’ve only tried the latter so far; finding enough resources and dealing with AI mobs is quite tense enough without adding PvP to the mix. PvE still isn’t exactly co-operative; loot drops on a first-come first-served basis, meaning you can expend precious ammunition and health packs defeating tough mobs only for another player to swoop in and nick the gear they drop (as opposed to being shot in the back by the other player prior to them nabbing the loot, as presumably happens in PvP). A team with voice comms might be able to share much-needed food and medicine amongst themselves as required, but “I propose a mutually beneficial arrangement by which we collectively engage tough opponents and equitably divide any resulting bounty” is quite difficult to convey to a random stranger via a limited set of emotes, so generally it’s best to steer well clear of other players. The situation pivots a bit should you reach the Dark Zone; by that time you’ve probably got a reasonable amount of kit so aren’t so desperate for every drop, and when you call in a helicopter for extraction you’re confronted by Hunters, new super-mobs with lots of nasty tricks like ducking into cover and healing after taking a bit of damage who are rather tough to take on solo. Survival has some of the same highs and lows of Rogue/Nethack: on one expedition you might get tooled up with enough weapons and armour to be able to take on anything but not find any medicine; on the next you’re wrapped up lovely and toastie in coat, boots, scarf and bobble hat and can wander around at leisure but lack any weapon more threatening than a pointed stick so get jumped by rioters. It’s not quite so variable, the map remains constant (New York is New York, after all) and loot containers spawn in the same places (though can contain different items). Random starting locations and unpredictable players have made every round fairly different enough far, but a little more variety might be needed in the long run. After a few attempts you get the hang of the basics, staying warm and accumulating loot, then it’s a fairly methodical process to get to the Dark Zone, and a rather abrupt difficulty spike with the Hunters at the extraction zone that can be quite frustrating. I’m not sure Survival as it stands it worth the cost of the DLC, but if you have the Season Pass anyway or there’s a sale sometime it adds another interesting string to The Division‘s bow, I can see myself popping back in from time to time, especially if it gets a couple of additional options. This entry was posted in games, zoso on December 6, 2016 by Zoso.